Drought & deer, oh my! This fall, I doubt my asters will perform like this after months of cruelty. Still, they’re resilient to punishment. As the days get shorter, they’ll do what asters do: bloom. Already, this wild aster is up and at ‘em. It’s more diminutive than usual, but not about to miss out on its mission. And somebody is very thankful. Around town, Pride of Barbados (Caesalpinia pulcherrima) is up to summer snuff to fuel whatever insects are still alive out there. Until very recently, these zinnias stuck it out as delightful traffic calmers on a busy Hyde Park street. Usually, my zinnias wither from fungus by mid-summer. Next year, I’m trying this tough, obviously well-drained hot spot! Heat from the asphalt seems to work. Back at the home front, my African hostas (Drimiopsis maculata) carried on their job to fill the shady/part sun spot under the island bed mountain laurel. They’ll go underground this winter, but weren’t fazed by last year’s extreme cold. Last year was my first to try them in the ground, rather than a protected pot. They popped back up once weather got warm. I’ll be dividing them next spring for more of these shady areas! They get some water, but obviously don’t need much. Recently a designer told me, “People want drought-tough, deer resistant gardens that don’t require any work.” Well, if you find a plant that never ever requires any work, I’d check it to see if it’s plastic! But this week on CTG, Tom meets with Tricia Martin from Forever Gardens in Georgetown for some plants that come close! One is native groundcover pigeonberry (Rivina humilis) that fulfills those shady spots. Mine rebounds from hard freeze just fine, to return in spring with summer flowers and fall berries for wildlife. I don’t have Rock penstemon (Penstemon baccharifolius) yet, but I’m planning to get some of these later blooming evergreen penstemons for sun! Thryallis (Galphimia gracilis) is one of Tricia’s drought and deer-resistant plants. I’ve loved mine to handle that hot afternoon blast and to hide/shade the air conditioner. Of course, my cenizo or Texas sage (Leucophyllum frutescens ) loves drought and scalding sun much more than monsoons or shade. I finally found the perfect spot for it in my hide-away side yard air conditioner spot against the thryallis and Iceberg rose. Recently, on CTG’s Facebook page, a viewer posted her picture of a deer nibbling at Texas sage. Well, we know how that goes. In tough times, they’ll eat anything. But add Tricia’s list to yours, or visit her in Georgetown for drought tough options, deer or not! Since new plants and vegetable seedlings benefit from some shading, Daphne explains why this technique helps, not just in these tough times, but whenever you’re establishing newbies when it’s too danged hot. We thank Angela Plunkett for her great tip on how she’s shielded both new and established plants when they were getting sunburned. Being resourceful, she used some weed barrier fabric, installed on metal T posts from her neighbor. Shade fabric would do the trick too, but weed barrier’s what she had. I love innovative shed-scavenging! Very quickly, her sunburned plants recovered. Daphne’s plant of the week is another drought-tough, deer resistant native, flame acanthus (Anisicanthus quadrifidus var. wrightii ). Believe me, it’s kept my hummingbirds fed this summer! Viewer Robert Breeze planted one this spring. Despite drought, it took off with nary a whimper. His young hummingbirds love it, but they also collect at his “water cooler.” All you need is one part sugar to 4 parts water to help keep them alive when many of their plant food sources are on vacation. On tour, see how Sharing Nature’s Garden blogger and Master Gardener Diana Kirby fends off deer in her front yard design. In back, she grows vegetables, more plants for wildlife, and ever-changing seasonal color to frame the family’s outdoor kitchen and patios. And, she does take care of the deer, too, since they are certainly part of her ecology. 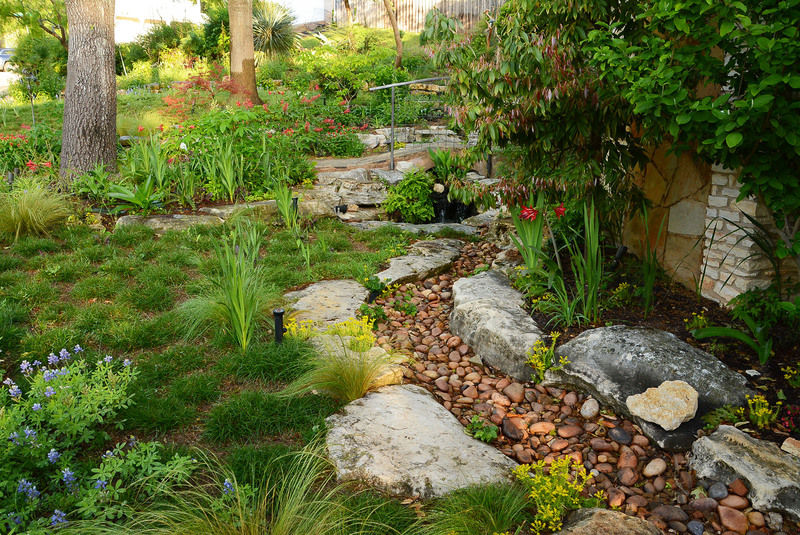 If you’ve got drainage problems, get Diana’s beautiful treatment for a dry stream bed. Yes, she’s suffered from drought like us all since we taped this, but mostly, her plants will make it through. Her concepts, philosophy, and design are for the long-term picture, which is what matters most. Speaking of the Travis County Master Gardeners, here’s a book that you need to nab this very minute: Creating a Drought-Resistant Garden in Central Texas. Really, this has everything you want: design tips, soil insight, plant lists, disease identification, nutrient deficiency, to-do lists, resources, deer resistant plants, and only a ton more. This is an essential reference for new and veteran gardeners. It’s compiled by gardeners from RIGHT HERE. If you already thought you knew everything, get ready for new insight. Find out more and nab it at these nurseries. One topic they address is lawns. Certainly, dead lawns top my email questions these days. Yes, for a lot of us, it means coming up with something else. In some cases, though, you may be able to salvage your lawn if that’s what you need to do for now. So, this week, John Dromgoole explains the difference between take-all patch, brown patch, and chinch bug damage, and how to resolve those issues. Augie doggie’s Pet of the Week is Mr. Leo Lionni, who loves to eat any kind of grass! In just one year, Jennie and Matt Horvath revived a long-gone family nursery that most recently housed a barbeque joint. Already, they’re serving up gorgeous gardens with native plants for drought, deer resistance and wildlife habitat, along with annual color and indoor intrigue. On tour, seasonal flooding and a steep ravine only good for ziplining prompted Natalie and Bob Bennett’s plant-tiered waterfall, ponds, and front yard sedge and wildflower meadow. Uh oh: kitty used your vegetable bed as a litter box. Daphne answers: Can we plant vegetables in cat-littered beds? Fungal disease and pest insects are upon us. John explains how to take charge.